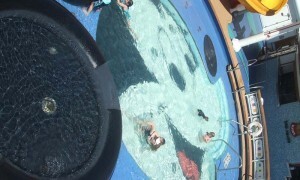 It is time to go on a Disney Cruise and with Kids Free it is hard to pass up this great Disney Cruise Line offer. UPDATED DATES: Kids 17 and under sail FREE* when traveling with two full-fare Guests in the same stateroom in Categories 4A-10C on most Mexican Riviera sailings Jan. 8 – Feb. 5, 2012. Government Taxes and Fees not included. Departing from Los Angeles, you can enjoy the beauty and fun of the Baja California and Mexican coasts on a voyage filled with unmatched Disney entertainment, legendary service and magic for everyone of every age. *This offer is only available to residents of the U.S. and Canada. Offer applies only to stateroom categories 4A-10C for most sail dates 1/8/12 – 3/4/12. Excludes suite/concierge staterooms and category with restrictions OGT, IGT, VGT. The number of staterooms allocated for this offer is limited. There are a limited number of staterooms for four or more guests. Must mention booking code FKMR. This offer cannot be combined with any other special offers or discounts. Additional Terms and Conditions apply.